there's a reason why the good fathers buried them there to be forgotten." Alien Remains Found At The Vatican. Pope Told To Remain Silent. Many alien skulls were found during a restoration project at the Vatican Library. Rendition of the appearance of the excavated skull when alive. CN. THE VATICAN. SPECIAL REPORT. Skeletal remains resembling 'space aliens' have been excavated from the basement floor of a centuries old vault under the Vatican Library. The Library had been undergoing a major restoration to its' underground vaults, of which many, CN has learned, still contained dirt floors that have not felt a human foot in over 500 years. 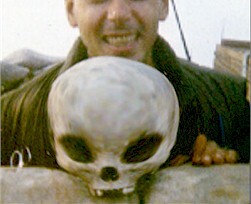 The above picture of a restoration worker holding an alien skull was obtained by CN through an anonymous carrier. The Vatican Military has closed all entry to the Library. Although a Vatican spokesperson was quoted expressing his awe and excitement concerning the find; he later disavowed any knowledge of the comment. Press sources have confirmed that an unprecedented command of silence has been enacted by Pope John Paul upon the request of several world security organizations. A world security agency meets with the Pope. UFO organizations are already calling this "the great world government cover-up." Mary Peterson, chairperson for SART (Space Aliens are Real and a Threat), states her opinion "what lies beneath the Vatican floors belongs in our Universities to be studied. This only proves the theory that world government has known of aliens all along. And the Vatican is essentially it's own country with its' own government and military." The 'fear of God' has already been put into the hearts of many of the faithful. Sister Judy Mebosa, chef at St. John's Cathedral in London, stated "it's the mark that the end is near. Whatever those remains represent, there's a reason why the good fathers buried them there to be forgotten. And there's a reason why God has allowed them to be found." Michael Maregski, Lutheran pastor of Our Holy Father in Rome, is quoted as saying "the ufologists have been speculating for many years that aliens may have been portrayed as angels to our ancestors in antiquity. If this speculation turns out to be proven true; why would angels be buried at the Vatican only to be forgotten?" Father Edward Muldoon, of St. Jude's in Rome, answered pastor Michael Maregski's question with "maybe they are angels, but remember, there were two groups of angels." United States envoy, James D. Arnold, states "everyone just needs to calm down about this matter. The Vatican area was once swamp land. I think people are just seeing the effects of swamp gas." I have received a message from Monsignor Corrado Balducci of the Vatican, relayed through German UFOlogist Michael Hesemann, that the good Monsignor seeks that I make a couple of clarifications in an original posting I published several months ago. It is noteworthy that the Monsignor does not deny the core message in the postings. Many of you will recall that at that time, I passed on information that Monsignor Balducci, a consultant to the Vatican on demonology and spiritual matters, and a close friend of the Pope, has gone on Italian national television five times giving interviews about extraterrestrial encounters as real and actually occuring to many people, as not from the devil, and as worthy of scientific investigation. In my earliest dispatch on this breakthrough news, I relayed that the Monsignor was part of a Vatican commision on the UFO matter. Subsequent information has clarified that the Monsignor has indeed served on a Vatican commission, but that commission is not created to study the UFO phenemenon. Monsignor Balducci is also part of a small group of fellow demonologists, and has provided consultation to the Vatican on spiritual aspects of extraterrestrial encounters, but not in his position as member of the Vatican commission. In the earliest dispatch, I also relayed information from the informant that the Vatican was getting information on extraterrestrial encounters cases from the Papal Nunciatures (embassies) in various countries. Monsignor Balducci wants it understood that the Nunciatures are not the source of these cases. I have corrected that inference of my informant in subsequent postings, to make it clear that Monsignor Balducci is getting his extraterrestrial encounter cases from elsewhere. For convenience, I am attaching the updated posting on Monsighnor Balducci and his highly-significant statements. Monsignor Corrado Balducci, a theologian member of the Vatican Curia (governing body), and an insider close to the Pope, has gone on Italian national television five times, including recent months, to proclaim that extraterrestrial contact is a real phenomenon. 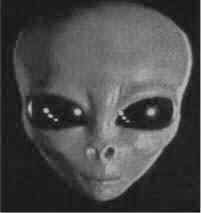 Balducci provided an analysis of extraterrestrials that he feels is consistent with the Catholic Church's understanding of theology. Monsignor Balducci emphasizes that extraterrestrial encounters "are NOT demonic, they are NOT due to psychological impairment, they are NOT a case of entity attachment, but these encounters deserve to be studied carefully." Since Monsignor Balducci is a demonology expert and consultant to the Vatican , and since the Catholic Church has historically demonized many new phenomena that were poorly understood, his stating that the Church does not censure these encounters is all the more remarkable. Balducci revealed to a visiting American professional that the Vatican is closely following this phenomenon quietly. My informant originally surmised that the Vatican is receiving much information about extraterrestrials and their contacts with humans from its Nunciatures (embassies) in various countries. But subsequent information indicated that the Monsignor has gotten his cases from other sources. Monsignor Balducci is a member of a group which acts as consultants to the Vatican on various matters concerning humans in possible contact with supernatural beings. As such, the matter of extraterrestrial encounters would fall within their purview, and possibly as well the spiritual significance of the emerging general realization of extraterrestrial contact. Parallel information from National Security Council scientist Dr. Michael Wolf , a member of the NSC's SSG subcommittee for managing the UFO phenomenon, as well as from noted author and Vatican expert Father Malachi Martin, suggests that the Vatican is concerned that it will have a major doctrinal updating situation on its hands when extraterrestrial contact becomes authoritatively announced by world governments over the next several years. Parenthetically, it can be observed that the Vatican Curia member's declarations on Italian national television represent technically the first declaration by an official of a Major Power government, even if "speaking as an individual", that extraterrestrial contact is real and happening, and deserves serious study. Also, Whitley Strieber has just come out with a new book, "Confirmation", which features an interview, in which Monsignor Balducci makes additional striking comments about the extraterrestrials as probably superior spiritual beings. Dr. Richard Boylan is a behavioral scientist, university instructor, certified clinical hypnotherapist, and researcher into extraterrestrial-human encounters. ÓCopyright James Gilliland 2001 all rights reserved.